The intent of this page is to provide information for people whose cats have had seizures. Seizures are a serious problem, and a cat that has had a seizure should be taken to a veterinarian for proper diagnosis. A proper diagnosis may be expensive and may take some time, but there is usually an underlying cause that can be eliminated or appropriate treatment that can be prescribed. The information in this page is not meant to substitute for a veterinarian's advice, but to aid those who are trying to learn more about their cat's illness and to encourage owners of cats that have had seizures to have their cat's illness diagnosed as quickly as possible. More clinical information is available through the references at the bottom of this article. It is important to understand the difference between epilepsy and seizures. Seizures, which range from unusual mood swings to uncontrollable thrashing and loss of body control, are symptoms of a disease. Causes of seizures include infections, tumors, toxic chemicals, and epilepsy. Most seizures in cats have a cause other than epilepsy. It's most useful to think of epilepsy as a word for seizures for which no other cause has been found. You will sometimes see epilepsy divided into idiopathic, or primary, epilepsy; and symptomatic, or secondary, epilepsy. Idiopathic epilepsy is the term used for seizures that appear to have no other cause. Symptomatic epilepsy refers to seizures caused by an underlying condition. Regardless of the terms used, the primary goal when treating a cat with seizures is to identify the disease causing the seizures, assuming it is epilepsy only if no other cause can be found. Seizures should not go untreated. There are risks of choking during a seizure, and more importantly, the seizures may be symptomatic of an underlying disease that can and should be treated. Anti-convulsant drugs may be effective in controlling the seizures, depending on the exact diagnosis. If you observe your cat having what you believe is a seizure, the most important thing to do is to observe every detail you can about it so it can be described to your vet. Frequently, your vet will never actually be able to observe your cat having a seizure, so your description is important to the diagnosis. Try to observe breathing patterns; paddling, motion, or rigidness of limbs; eye dilation or motion; salivation; body twisting; muscle twitching; and duration. It is important to observe which parts of the body are involved. After the seizure is over, your presence and attention will probably comfort your cat as it regains consciousness. If a cat is having a single prolonged seizure, continuous seizures without recovery between them, or two or more isolated seizures within 24 hours, seek medical attention immediately. Aggressive treatment is recommended, usually intravenous dosage of diazepam. Your close observation and careful description will help your vet make a diagnosis. Specifically, partial motor seizures are more indicative of symptomatic epilepsy (suggesting an underlying disease), while idiopathic epilepsy usually manifests itself in strictly generalized seizures. This distinction is not conclusive; it is just one piece of evidence to be considered. A complete physical and neurological examination should be performed on any cat with seizures. Often blood tests are indicated to detect any generalized illness that may be causing the seizures. These may include FeLV, toxoplasmosis, FIV, FIP, urinalysis, complete blood cell count (CBC), and biochemical profile. Based on these results, further tests may be indicated. These may include analysis of spinal fluid to detect encephalitis and imaging procedures, such as MRI or CT, to detect lesions such as tumors. You should be aware that few vets have any experience with seizures in cats. They are rare, compared with seizures in dogs. Ask your vet questions about what tests they are considering and what your options are. A vet should not be offended if you get a second opinion. This is important to remember because I have received email from owners of several cats that have died from conditions that could have been detected with a simple blood test and treated quite easily, but were not. If your vet cannot find any cause of the seizures and has not done bloodwork, you should be concerned. If a disease is found to be causing the seizures, the best treatment is to remove or correct the underlying problem. The success of such treatment depends on your vet's ability to identify and treat the disease or remove the growth that is causing the seizures. For example, surgery is often effective for some tumors in cats. If the diagnosis is epilepsy or if the underlying disease is difficult to treat and/or not becoming worse, then the usual therapy is to control the seizures with anti-convulsant drugs. Phenobarbital is considered the initial drug of choice for feline epilepsy. Diazepam (valium) may also be effective but sometimes causes liver problems. The dosage must be adjusted individually to minimize side-effects. Again, this will require your careful observation; you will want to find the lowest dosage that will control the seizures. Potassium Bromide is also being used to treat epilepsy, particularly in cases where liver problems or ineffectiveness may prevent phenobarbital from being used to eliminate the seizures. Some people have suggested that a taurine deficiency may cause seizures. I have not yet seen any information based on scientific research that would support this belief. However, it is certainly true that a cat having seizures should be fed a balanced diet that supplies adequate taurine. The success of treating your cat's seizures depends on the cause of the seizures and the cat's response to medication. This is a difficult condition to diagnose, so it may take several trips to the vet as different diagnostic paths are pursued. Furthermore, your vet should not be upset if you seek a second opinion. If it is difficult to find the cause of your cat's seizures, your local vet may refer your cat to a regional teaching hospital that may be able to pursue a wider variety of tests and treatments and will generally be cheaper. Take your cat to a veterinarian. The most important step is to find a good veterinarian to take care of your cat. If your cat has had one seizure, you should call and make an appointment. If your cat has had more than one seizure in 24 hours, find a vet IMMEDIATELY. Learn about seizures and epilepsy. This page and the links at the bottom are excellent places to learn about feline epilepsy. Make sure your cat gets quality care. Ask your vet questions to see what tests are being done, what problem they suspect and what future course of action they recommend. Feline epilepsy is rare, so many vets are unfamiliar with it. I have received email from people whose vets have not even done blood tests on cats experiencing seizures and from people whose vets have just said to monitor the behavior of a cat that was having seizures more than once a week. In both cases, the seizures were curable, but the vet was doing nothing to help the cat. Bloodwork should always be done, and phenobarbital is generally prescribed when no other problem is evident. If your vet seems unaware of how to diagnose or treat seizures, find another vet who can. Seizures, or the disease causing them, can be fatal if not treated properly. Decide what your limits are. The decision of what lengths to go to is an issue between a pet owner and veterinarians. After our vet was unable to diagnose the cause of our cat's seizures, we were referred to a vet school. The vet school didn't find anything in their initial tests, either, so they asked us if we wanted to pursue an MRI or spinal fluid test. Because of the high cost and smaller chance that a useful diagnosis would be made from these tests, we elected not to pursue either of these options at the time and began treatment with phenobarbital. Since this has completely eliminated Shadow's seizures for over five years, we have never had a reason to reconsider these options. Follow up on the care. In some cases, your cat may be put on permanent medications. For Shadow, this is phenobarbital twice per day. If you need to give your cat regular medication, work it into your schedule and consider how to handle extended absences. We take Shadow with us on most of our trips. An article that focuses on dogs, but contains a lot of good information about epilepsy is Managing Epileptic Dogs by William B Thomas, from the University of Tennessee. Information on treatment of seizures with Potassium Bromide. As canine epilepsy is a much more common and well-understood problem, there is a great deal more information available about it on the web. 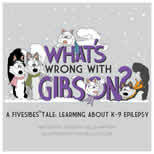 Both the Canine Epilepsy FAQ and the Epil-K9 Canine Epilepsy Resource Center contain lots of very useful information. Although the details concerning problems associated with specific breeds are, of course, irrelevant, most of the information provided there agrees with everything I've read and been told concerning feline epilepsy (although idiopathic epilepsy is much rarer in cats than dogs). Parent, JM. Diagnostic approach and medical treatment of seizure disorders. In Consultations in Feline Internal Medicine. 1997. Parent JM, Quesnel AD. Seizures in cats. Vet Clin N Am [Small Anim Pract]. 26:811-826,1996. Fenner, W. R. Epilepsy. In Consultations in Feline Internal Medicine 2. edited by J. R. August. Philadelphia. W.B. Saunders Co. 1994. pp. 437-447. Russo, M. E. Seizures. In Consultations in Feline Internal Medicine 1. edited by J. R. August. Philadelphia. W.B. Saunders Co. 1991. pp. 523-526. For other medical problems, consult the Medical Information portion of the rec.pets.cats FAQ. Thanks to the people who have provided information over the years as this page has been developed. Special thanks to Joane Parent, from the University of Guelph, who mailed me a copy of her paper "Seizures in Cats." This article is Copyright 1996-1999, Bruce Lowekamp. Permission to copy, translate, or otherwise redistribute this page is granted provided that this message remains; the URL of the original, http://www.cs.cmu.edu/People/lowekamp/feline_epilepsy.html, is retained as the source of the article; and the copy is not made for profit or commercial use. Any commercial or for-profit use requires written permission. The author assumes no liability for the result of actions taken based on information presented in this article. This article is not an alternative to the advice and care of a licensed professional veterinarian. While some of the information presented here may offer suggestions for choosing an appropriate veterinarian, the information is definitely not a substitute for a licensed veterinarian. The information presented here is to inform and comfort those people whose cat has had seizures and have taken or are about to take their cat to a veterinarian. If you think your cat is having a health problem, consult a licensed veterinarian!